We just completed our Experimental Design chapter in AP Statistics. It’s one of my favorites, as there are so many opportunities for fun, meaningful activities and class discussions. The activity in this post is an adaptation of a project I first heard of through my friends at Villanova University, where it is used in Introductory Statistics courses. Think about these “old wives’ tales” and slogans. Which ones are accepted to be true? What ones seem dubious? In this project, teams select a “famous saying” to explore. Using the principles of experimental design learned in AP Stats, teams design an experiment which could be use to test the claim. Treatments must be described, randomization procedures explained, and comparisons suggested. Should the experiment be blocked? Will a placebo be employed? Should blinding be used? These all must be addressed by the team in a powerpoint submitted to describe the project. 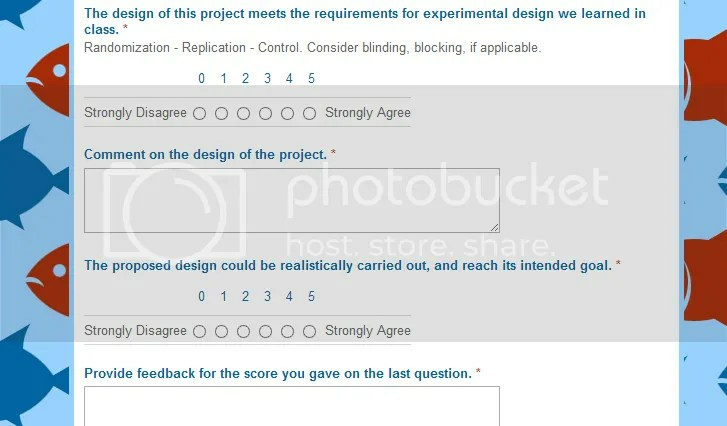 Finally, teams peer-assess other projects, and provide feedback. Below, you can download the project description, and the grading rubric. On the day the project is assigned, I give 15 minutes for the teams to form. Teams look over the list of topics, and are given a playing card. Then the draft of topics begins! The team drawing an ace gets to pick their topic first, then two, then 3….so that no topic is repeated in the class. Teams were given about two weeks to work on the project, as we continued through the unit. The actual creation of the project does not take that long, but we had the project simmering in the background as experimental design ideas were learned in class. 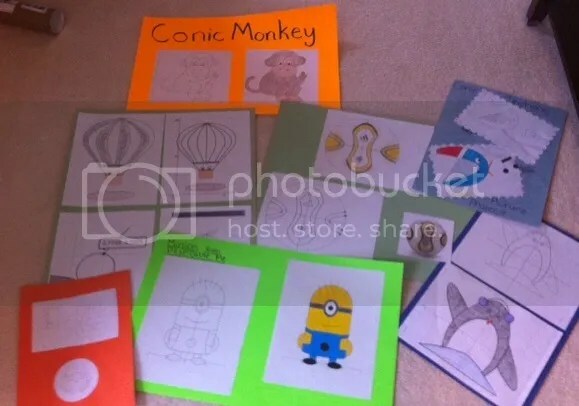 After we had all the projects, all students were assigned 3 of the projects to assess. Using a Google Form, students provided comments, which I then sorted and gave back to the teams. Amazing how students are usually in target when asked to grade. And the comments provided were mostly consructive and on point. The Puzzle Solutions You’ve Been Waiting For…. This post will present solutions to two puzzles I have presented here on the blog, and some ideas for extending the learning with your students. I often challenge classes with this game, letting kids play me and try to figure out the secrets. The beauty here is that my students are often polite souls, and will let me go first…which leads them to doom. It will often take a few days before a student can conquer me. And here is the message I sent back to Anthony, who requested the secrets to the game. Here’s the secret to the take-away game – if I can make it so that the number of dots remaining is a multiple of 4, then I will win the game – guaranteed. If they take away 3, I remove 1. When they remove 2, I remove 2. If they remove 1, I remove 3. The game is all about groups of 4. With 23 dots to start the game, I will offer the student a choice; who plays first. If they let me play first (which they often do because they want to be polite), then I erase 3 dots (leaving 20) and wait for their eventual demise. If they play first, then I need them to slip up and make it so that I can control the multiples of 4. If they erase 2 on their first move, then I remove 1, leaving 20. It often takes a few days of playings at the end of class for kids to develop the strategy. They will first realize that being left with 4 is sure doom. Then 8….then eventually they get it. This table shows the winning chair in the game, based on the number of chairs which start the game. Note that if the number of chairs is a power of 2, the winning chair will equal the number of chairs. From any multiple of 2, the winning chair goes up by 2, until the next power of 2 is reached. How would your students express this pattern? What vocabulary would they need to use in order to communicate the pattern? After a class develops the data table, challenge students to write a concise rule which will identify the winning chair. Then, have students trade their explanations and critique them. Could an algebra student develop a formula which outputs the winning chair, if the number of chairs is given? 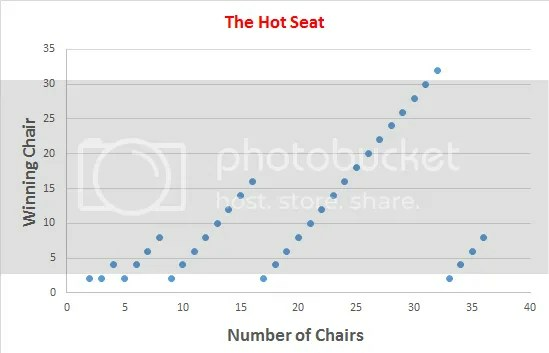 Take a look at the winning chairs, plotted vs the number of chairs. Can we write a function which follows the pattern? Share your function ideas in the comments, and enjoy the challenge. Dan Meyer’s recent post on “fake world” math tasks has me thinking about many of the openers and games I have used in my classroom. I have written about The Take-Away Game before, and I still use it often…until the kids learn how to beat me and the strategy is revealed. This next one is not so much a game, but more of a task, similar in some ways to the Locker Problem. Chair #1 is removed first. The next remaining chair is skipped, and the next chair removed. This continues, with chairs skipped and removed until only one chair remains. Like the “Take-Away Game”, I can’t recall where I first encountered this problem. They have both been sitting in my files for over a dozen years. If anyone can name a source, I’d be happy to award some credit. It’s not intimidating. We have a chance to draw, get out blocks, magnets….whatever we want to use to model the problem. Great for working in teams. I can let the problem marinate. On one day, I may ask the class “Where should I sit if there are 8 chairs?”, and come back the next day with “How about 24 chairs?” If it seems like discussion is flowing, I can put my foot on the gas. I can use this problem with all levels of students. If we need to create a data table and look for a pattern as a class, that can happen. 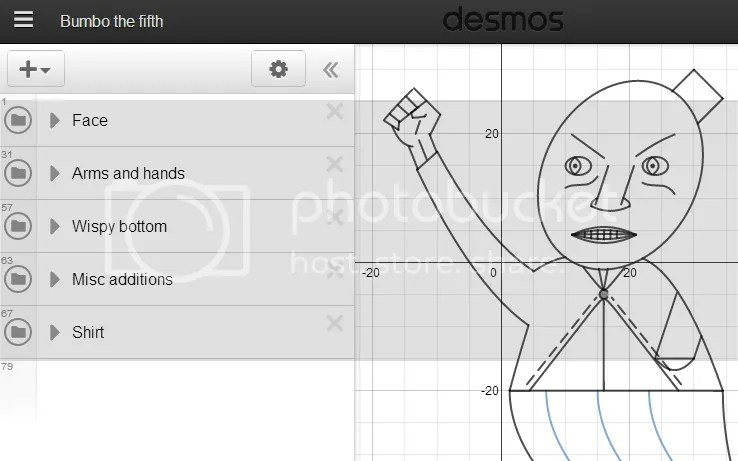 If my honors kids want to fly with it, that can also happen. The answer is not obvious, but a clear pattern eventually emerges if you model enough circles. And there will be some nice vocabulary opportunities as the payoff. There are a number of ways to express the solution. Later this week, I will post the “answer”. Until then, have fun moving around the furniture.